With a two-goal performance on Saturday night against the Winnipeg Jets, Florida Panthers forward Jaromir Jagr has passed Brett Hull to land in third place on the NHL’s all-time goal-scoring list. 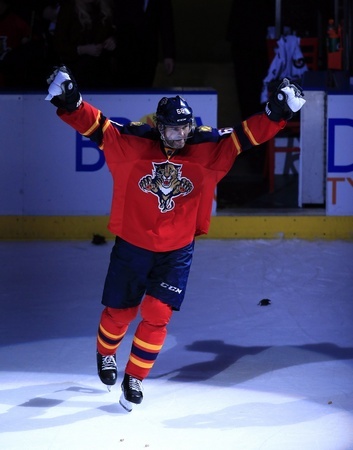 Jagr tied Hull with his 741st career goal in the second period and added his 742nd in the third period, giving his Panthers a 3-1 victory. He leads the team with 20 goals in 56 games, plus he has a shooting percentage of just under 20 percent. At the age of 44, Jagr is playing some astonishing hockey. He’s now fourth all-time in points, 10th all-time in games played and first overall in game-winning goals. At the rate the Czech-born Jagr has been playing, he could knock down even more milestones before he decides to hang up the skates. This is Jagr’s 19th season with 20 or more goals and he doesn’t show many signs of slowing down – especially when there are more goals to score and when the Panthers are putting up serious numbers. The club is 34-18-7, good for first in the Atlantic Division, and they’ve built a tremendous franchise with the likes of Jonathan Huberdeau, Vincent Trocheck, Aleksander Barkov, and Reilly Smith providing a firm base for the future. And when it comes down to it, there are more reasons for Jagr to continue pushing forward than there are for him to step aside. Jagr has played in 1,606 regular season career games for eight NHL teams. 439 of his 742 career goals came with the Pittsburgh Penguins, where he won two Stanley Cups. Jagr was drafted in 1990 by the Penguins, going fifth overall. He is the only active player remaining from that particularly deep draft, which included players like the top pick Owen Nolan, fellow Czech Petr Nedved, Keith Primeau, Mike Ricci, and goalie Martin Brodeur.